Any Honda could be called an adventure bike, but the CB500X takes the idea to extremes. This is a motorcycle ready for around-town errand-running and commuting, but it’s also just as ready for canyon carving. You can take adventure to the next level because the CB500X is equipped with an adjustable windscreen, larger fuel tank and perhaps most important, a generous amount of suspension travel—enough to take you off the pavement and onto the kind of dirt roads you might find on your travels. Ergonomically, the CB500X gives you wide handlebars and a classic upright seating position so you always feel in control. Bulletproof Twin-Cylinder Engine: Displacing 471cc’s, liquid cooled and featuring parallel cylinders with dual overhead cams, the CB500X powerplant is very efficient, especially with its performance-maximizing electronic Programmed Fuel Injection (PGM-FI). Naturally, it shares Honda’s reassuring reputation for reliability. Ride Ready For Adventure: The CB500X is designed to give you a great view of the road and plenty of room to shift your weight for maximum control. Utilizing a classic upright riding position with a wide handlebar, taller seat and a tighter knees-in fuel tank design, you can maximize your feeling of oneness with the bike and the road. Unique Style: The CB500X is a lightweight, dynamic motorcycle that offers adventure style with an upright riding position. While not a dual-sport, the new CB500X still has the posture of an adventure machine with a unique fuel tank design that offers the ability to freely move the body weight. 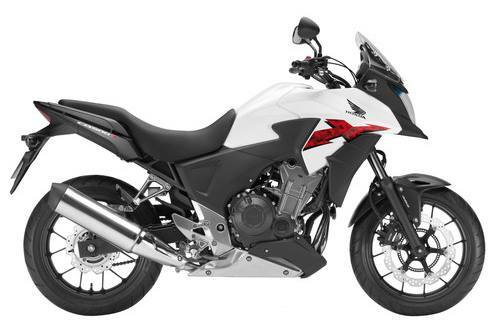 DOHC Twin Cylinder Engine: Honda twins are famous for their versatility, and the new CB500X engine is one of our best ever. Using the same piston bore size as our CBR600RR sportbike, the parallel-twin engine offers accessible performance across all RPM ranges. Steel-Tube Frame: A motorcycle’s frame is the basis for its handling. A new take on a classic construction, the CB500X’s diamond-shaped steel-tube mainframe ties to the engine with four mounts, offering a rock-solid foundation for superior ride and handling. Long-Travel Front Suspension: The long stroke 41mm front fork yields a full 5.5" of travel, and a wide handlebar allows for easy steering inputs. Pro-Link Rear Suspension: A sophisticated chassis with Honda Pro-Link® rear suspension, with 9-stage preload and 4.7 inches travel gives you a comfortable ride over small bumps, while capably absorbing bigger bumps to increase riding comfort and handling. Halogen Headlight: A single 60-watt H4 halogen headlight and multi-facet reflector on the CB500X give the front end a unique look and also project plenty of light on the road for visibility. Adjustable Windscreen: The windscreen on the CB500X is manually adjustable up to 40mm for optimal wind protection. Step Seat: The new CB500X’s 32-inch seat height and unrestricted riding position offer freedom of movement for usage in both touring and commuting. You’ll find that it’s perfect for around-town riding and also offers plenty of room for a passenger.